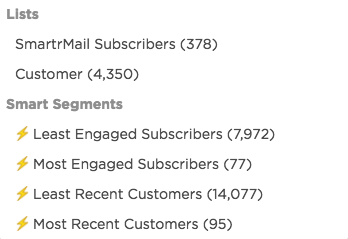 SmartrMail's Smart Segments are used to create targeted audiences defined by data collected from your e-commerce store or your emails, e.g., subscribers who've purchased products, subscribers who've opened/clicked emails, subscribers who've been added during certain time frames. Send Targeted Campaigns: Rather than blast your entire list with an un-targeted message, you can segment your list by subscribers who are interested in certain products and send them more relevant content. Trigger Automated flows: Whenever a subscriber meets the set rules in your segment, you can use our Automated flows feature to send triggered emails, e.g. Welcome Emails, Post-Purchase Emails, Win-Back Emails. Manage and Clean Your Lists: You can segment subscribers who've stopped engaging with your emails and easily delete them from your list. What's the difference between a list and a segment? Lists within SmartrMail are added through your e-commerce platform integration, imported from another ESP, uploaded via CSV, or added through our popup or embedded HTML form. Segments are created within SmartrMail and are sections of your lists filtered based on conditions/rules set by you. Note that deleting a smart segment will not affect the number of subscribers you hold in your Smartrmail account, but deleting an email list will delete subscribers that are in it. How else can I use Smart Segments? Targeted Back-in-Stock Emails: Notify customers who've purchased an item previously. Targeted New Product Releases: Notify customers of new products added to a certain brand or collection that they've previously purchased from. Loyalty and VIP Programs: Send special offers to customers who've spent over a certain threshold. We've kept our Automated flows open ended so you can be creative and implement your email strategy without restrictions. Play around with it and if you have any questions reach out to our support team!